An Arma autonomous shuttle bus in La Defense business district. 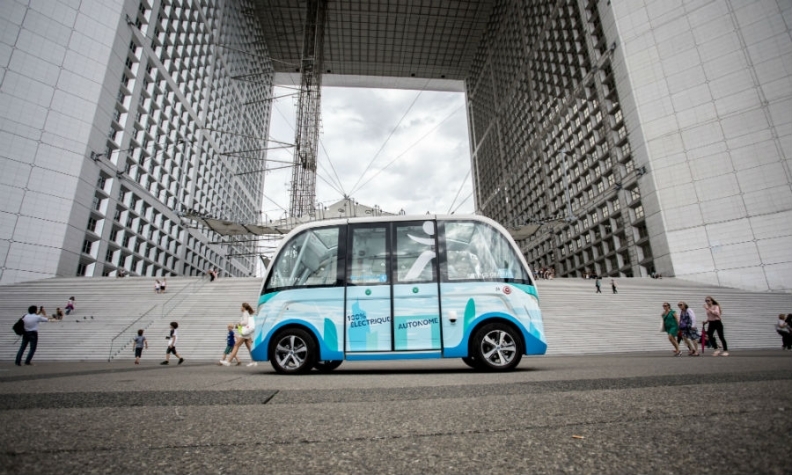 PARIS -- Navya Technologies, a French maker of driverless shuttles, is training its robot-driven machines to navigate around bankers and corporate directors at Paris’ buzzing business district, ahead of a push to sell 150 vehicles in the U.S. by the end of 2018. Backed by French supplier Valeo, Navya is taking part in a $1 million investment into a plant in Saline, Michigan to assemble battery-powered vehicles for the U.S. market. Its current factory in Lyon, France, has pushed out some 50 shuttles so far to demos in places such as London’s Heathrow airport and Parisian business neighborhood La Defense, where the likes of Societe Generale, insurers Axa and Allianz have offices. "The entire world is positioning itself on this market -- car-part makers, cities, government, but nobody has a clear vision of what autonomous driving will look like," CEO Christophe Sapet said in an interview. "Of course we will go head to head with Uber, Mercedes and the others, but we’ll be faster." The startup joins a host of companies exploring automated driving, from Google to HERE and traditional carmakers. While many vehicles today already offer features like driving assistance on highways or during parking, full autonomy is a long-term target for some. Easymile, which is backed by train-maker Alstom, and U.S.-based Local Motors also make driverless shuttles. Sapet says Navya intends to produce both the shuttles and their software, and proving that the vehicles are safe to use in cities before contenders. Navya forecasts it will sell some 450 units by the end of next year, a third of them in the U.S., where it has already shipped a couple of vehicles to the University of Michigan for on-campus transport. Cities, universities and companies that want to move staff around are all potential customers, Sapet said. It sold two vehicles to SB Drive, a unit of Japan’s SoftBank Group. Navya raised 30 million euros in funding in October from Valeo, as well as Keolis, a subsidiary of France’s rail operator, and Qatar-owned Group 8 Holding. The startup’s majority shareholder is Robolution Capital, the fund lead by Bruno Bonnell, an entrepreneur in robotics who also founded video-game developer Atari. Navya’s current Arma model, which fits as many as 15 passengers and has a peak speed of about 16 mph (26 kph), come across several hundreds of pedestrians each day near Paris. The on-board computer uses a mix of geolocalization signals, sensors, cameras and light-beam radars to scan and interpret the surroundings. Mapping data is key for operations. The minibus rolls around at about 3 mph (5 kph) in fact -- not much faster than a walking human, though it does manage to attract passengers who are either trying to avoid the rain, carrying luggage, or just plain curious. The robot driver, monitored remotely by a team of engineers, learns new skills along the way.